There's a special treat in Samarkand for Uzbek Journeys clients. Talented architect-turned-designer Nargis Bekmuhamedova arranges a delightful fashion show and dinner accompanied by classical Uzbek music in her café and boutique. 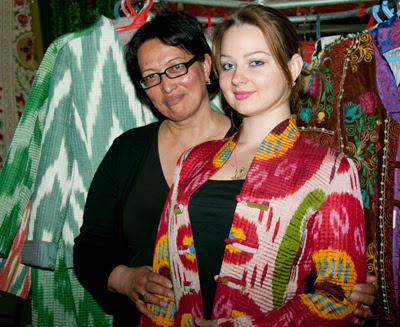 Nargis is my favourite Uzbek designer. She understands fabric and structure: her signature touch is combining old and new textiles, sometimes in startlingly different patterns, to create one-off jackets, skirts and dresses. Reversible coats, jackets and vests are her speciality. She understands body shapes, so garments are flattering and wearable. The models she selects for the fashion parade are also *normal people*, including her anaesthetist daughter, so clients can see just how well her pieces work. Nargis also works closely with Ferghana ikat masters to create unique ikat fabrics. Nargis produces a range of accessories: hats, skull caps, belts and scarves that all that bit out of the ordinary and mightily tempting. There is a sewing team on-site: if a garment needs altering it can be done. And if you have time, she may be able to create a piece just for you. I have a stunning coat made from an old, red suzani with an orange, quilted lining. Whenever I wear it I am stopped and asked about it. 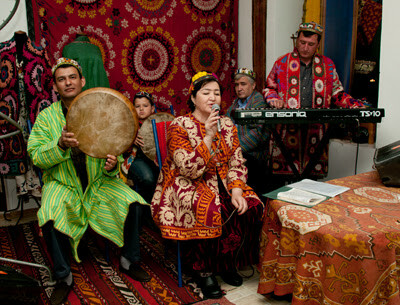 The local musicians provide a chance to hear Uzbek traditional pieces hauntingly sung in Uzbek and Tajik. They use a mix of old and contemporary instruments. Nargis' kitchen is well known, and rightly so. Her aubergine starters, spinach-stuffed pies, Greek salads and home-made halva are excellent. The cafe's location is unbeatable - adjacent to Bibi Khanum mosque, famed for its dome and romantic legend. The café, at 12 Tashkent Street Samarkand, is usually not open of an evening unless you let Nargis know in advance. During the day, try to grab a table on the terrace, take in the beauty of Bibi Khanum and sip a cardamon coffee. And of course slip into the boutique: it is a treasure trove, so give yourself time to rummage through everything. 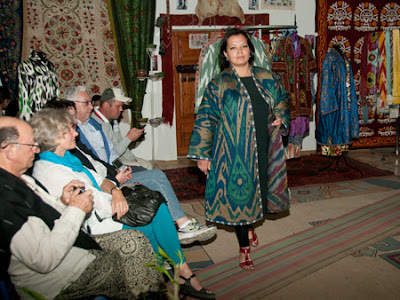 If you would like to visit Nargis' boutique, please consider joining an Uzbek Journeys tour. Images: Courtesy and copyright Tom Tauber.